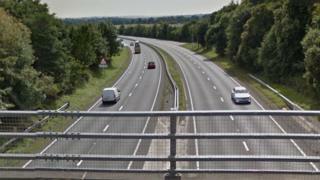 A three-vehicle crash closed a section of the A483 Wrexham bypass for a short time on Thursday morning. The northbound section has since reopened following the collision between Junction 4 Coedpoeth and Junction 5, the A541 Mold Road turn-off. North Wales Police said there had been several accidents on Thursday. A yellow "be aware" warning for ice is in place across Wales until 11:00 GMT.